How can one survive under capitalism? This seems to be the question “God, Man, Dog” kept raising in its two-hour running time. Directed by Singing Chen, whose debut feature “My Name is A-Ming” won the best picture award at the Taipei International Film Festival, “God, Man Dog” is only her second feature film after ten years. With an ensemble cast, and a multiple narrative, some has compared the film to Paul Haggis’ “Crash” (there is also a car crash at the climax of “God”), which came out three years before “God” and was a big sensation in Taiwan at the time. However, while Haggis was eager to offer an answer to a pressing social issue, Chen was more cautious. There is no real answer given by the film. No true cathartic moment after we witness these characters go through their turmoils. Following a diverse group of characters, the movie tries to capture the social structure of Taiwan. We see an upper-middle class couple dealing with the wife’s depression after she gave birth to a child. We see an indigenous family, in which the father is trying to overcome his alcoholism; while the daughter is trying to climb the social ladder through her talent in free style boxing. 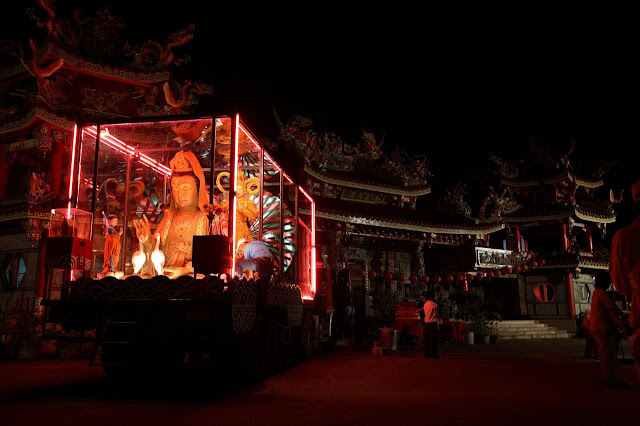 We see a disabled Buddha statue rescuer, who somehow can connect with gods, driving a truck with a transparent box on the back, within which are all the statues that he has saved. All of these characters are trying to deal with some obstacles imposed by external objects. The middle class wife is dealing with the loss of her child; the indigenous father is controlled by alcohol; and the disabled man is trying to buy a new prosthetic leg. What’s more nuanced in Chen’s approach is that she doesn’t assume one simple answer. It’s not like she is saying that everything external is bad for you. Instead, she shows that for someone, it is only with the help of an external tool, that the person can function smoothly again. A similar ambiguity can be found in the narrative as well. Near the end of the film, the indigenous father starts drinking again, because he has to lie to avoid a homicide charge. He renounces his Christianity faith, and plans to burn himself to death. It’s midnight. He is already intoxicated, and we see him carrying a barrel of gasoline walking on a road in the mountain. Suddenly, he sees the disabled man’s truck full of Buddha statues. The faces of these Buddhas are lit. The truck becomes a small shrine for the father. As soon as he sees this, he is touched and gives up his suicide plan. Yet, Chen doesn’t give the character a clear-cut happy ending. Instead, the father is more confused than ever. Although there is a glimmer of hope in this world, no one can be sure that he or she can really be saved. In an interesting way, “God” is a narrative experiment of how to “show” social structure visually and aurally. Chen is very good at showing how an image-based capitalism is always looming over characters’ heads, through some simple but powerful mise-en-scene of things and posters in the background usually. She is also very good at using one or two objects to show us the inequality of the society we live in. We see the indigenous family helping to transport some very high-end peaches to an advertisement agency, just after we saw someone at the agency is throwing away more rotten fruits that are used only for photographing. But we don’t really see, or have a sense of what are the structural causes of these characters’ turmoils. We might say that it is because they are born in this kind of society so they will naturally have the problems they’ve encountered. But this seems surprisingly unspecific for a director who has a keen eye on the oppressed and marginalized in the society. Maybe this is Chen’s way to simplify the complexity of social life. In a way, this goes hand in hand with her visual representation. Chen often frames her characters at the edge of the frame, usually in shallow focus. It is a shorthand way to communicate to the audience that these characters are trapped, unhinged, and can’t find a way out. It might also suggest that these characters are locked in their own bubbles and fail to communicate with one another truthfully. In one scene, when the middle-class couple are arguing with each other, the film doesn’t show their conversation in conventional shot/reverse shots, instead, it shows the verbal fight in one long take, and presents each character in shallow focus. It is an interesting strategy to see, but it also limits the audience’s ability to explore the frame. 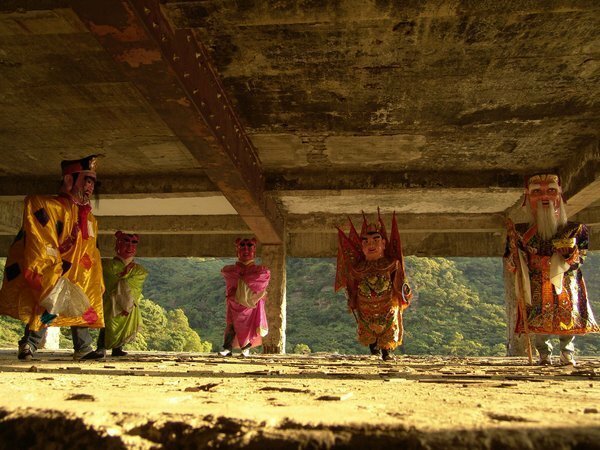 With an ambitious narrative structure, a thoughtful visual/aural design, and some interesting performances, “God Man Dog” is a powerful take on the Taiwanese society in the early 2000.